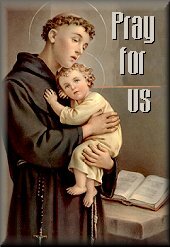 We, the fraternity of St. Anthony, inspired by the vision of St. Francis, commit ourselves to the Gospel as our Way of Life; GOING FROM GOSPEL TO LIFE AND LIFE TO THE GOSPEL. We believe that we are called to fraternity to share a life of joy and peace as well as to draw our inspiration from the Cross of Jesus- as Francis did. We believe we are called to be renewed continually through the celebration of the Eucharist and to go forth to rebuild the Church through our witness. Our Current Newsletter has changed hands. For now, please see the current, up-to-the- minute headlines at Catholic World News. Please visit Misericordia by clicking this logo.